I’d like to highlight a pair of Special Sections in the early 2017 issues of Critical Public Health. The first is “The Publics of Public Health in Africa,” guest edited by Ann H. Kelly, Hayley MacGregor, and Catherine M. Montgomery. The second is “Anthropological Interrogations of Evidence-Based Global Health,” guest edited by Elsa L. Fan and Elanah Uretsky. Here are the abstracts for the articles in both sections! Excerpt: How do we understand the public character of public health in contemporary Africa? What are the parameters of community engagement in health care delivery, medical research and disease control programmes? To what extent is public health in Africa a project led by African Governments? Through what political processes and deliberative practices can African publics influence the priorities of research in health sciences and interventions which aim in broad terms to improve the health of such publics? Drawing insight from empirical research conducted with African scientists, nurses, community members, clinical trialists and policy-makers, this special section examines the multiple ways in which the publiccomes into being around public health provisioning and investigation in sub-Saharan Africa, its role and political reach. Collectively, these papers show how contestation and negotiation around different ideas about who the public is and what being public means can lead to the emergence of conflicting understandings, with implications for who and what is seen to represent the public interest, and for the acceptance of research and other interventions. I assume everyone is, like me, tired of (and stressed out about) the US election, so let&rsquo;s take a break from that to take a quick look around at some interesting recent public health stories. Many of you perhaps heard about the fact that M&eacute;decins Sans Fronti&egrave;res&nbsp;this month turned down a donation of one million Prevnar13 vaccines from Pfizer. Prevnar13 is a vaccine which protects against a particular bacteria that causes pneumonia, the leading cause of death of children under 5 (1.4 million deaths per year), and is recommended for all infants. Pfizer makes USD 6.245 billion in revenue per year from this drug alone, but it is too expensive for MSF to purchase regularly. This article in The Atlantic details the problems with donations of this kind, the reasons for which MSF turned it down, and the opacity of vaccine prices on the global market. In response to discussions with my colleagues about ways to encourage our students to read more ethnographies, I designed a new assignment for “Anthropology of Health, Illness and Medicine,&rdquo; the last time I taught it. Students were asked to read an ethnographic study with a medical anthropology theme (i.e. a “medical ethnography&rdquo;) and to present a synopsis to their seminar group. My ulterior motive was to encourage students to read some of the medical ethnographies at the top of my heap, so that I could at least learn more about them, if I could not get around to reading them myself. In this respect, the assignment was only partially successful. The books at the top of my list were either not selected by any of the students, or were read by students in the seminar groups led by my colleague. However, several books that were (originally) much closer to the bottom of the heap (and some not even on the list of recommended ethnographies) generated memorable class discussions and have piqued&nbsp;my interest. As I am getting ready to send my publisher the final version of my own forthcoming book on the “Hispanic health paradox&rdquo; and “health sovereignty&rdquo; in the United States, Gálvez&rsquo;s (2011) Patient Citizens, Immigrant Mothers: Mexican Women, Public Prenatal Care, and the Birth-weight Paradox is at the top of the heap of books that I need to finish reading. A study that included data from 171 countries showed a reduction in maternal mortality, with 385 deaths per 100,000 births in 1990 compared to 216 in 2015. Percentage-wise, the reduction varied in this time period from an annual reduction of 1.8% in the Caribbean region to 5% in East Asia (The Lancet 387; p462–474, 2016). This, of course, is encouraging news, since around nearly 830 women die each day of preventable causes related with pregnancy and childbirth. Ninety-nine percent of maternal mortality occurs developing countries, and is higher in rural areas and the poorest communities, according to data from the World Health Organisation (WHO). Improvement in maternal health was one of the eight Millennium Development Goals (MDGs) adopted by the international community in 2000. With respect to these, countries committed to reducing maternal mortality by 75% between 1990 and 2015. Since 1990, the number of maternal deaths has fallen by 43%. Several sub-Saharan countries reduced their maternal mortality to half, while in other regions, such as Asia and North Africa, the progress has been even greater. Between 1990 and 2015, world maternal mortality rates (MMR) i.e. 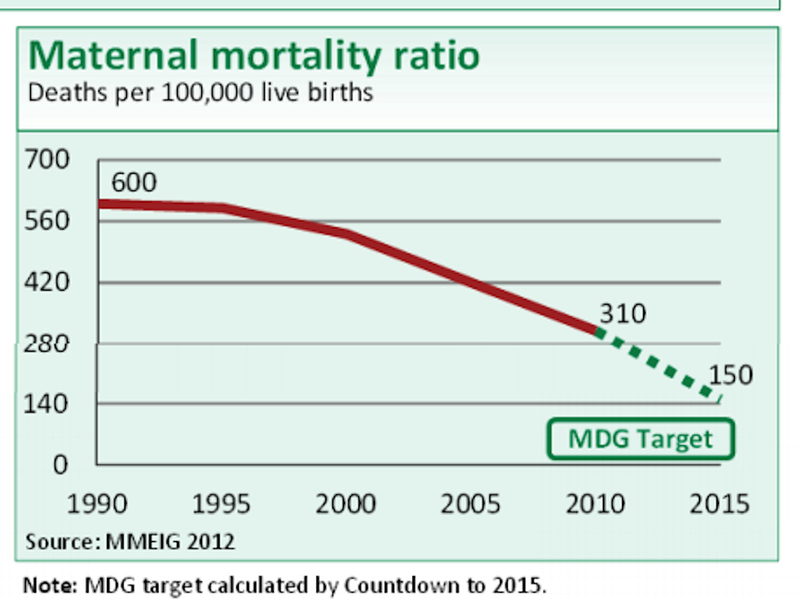 the number of maternal deaths per 100,000 live births, only fell by 2.3% per year. 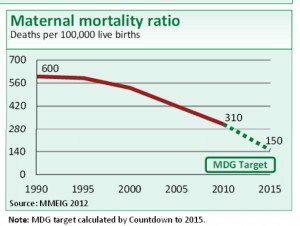 However, an acceleration in this reduction was observed from 2000, and in fact in some countries, the annual reductions in maternal mortality between 2000 and 2010 exceeded the 5.5% necessary to reach the MDGs. La entrada Global maternal mortality: significantly reduced in the last 15 years aparece primero en Observatorio de Bioética, UCV. The CDC has warned women from the U.S. who are pregnant or thinking about becoming pregnant not to travel to certain areas in Central and South America. Additionally, infectious disease specialists are concerned that Zika may adapt to transmission by a type of mosquito common in 32 states in the U.S. There is no commercial test available to diagnose Zika; however, there are testing protocols available through the CDC and some state health departments. According to Francis Collins, Director of the National Institutes of Health, researchers are working to develop a diagnostic test that could be widely available. If such a test becomes available, pregnant women may seek out this test to determine whether they have been infected. Additionally, because microcephaly is such a severe birth defect, women considering pregnancy may begin to request diagnostic testing for Zika. This consumer-driven demand for pre-conception testing could create a window of opportunity to improve delivery of pre-conception care should primary-care providers seize on this opportunity. Pre-conception care is not routinely provided to women of reproductive age. Primary-care providers have said this is because women do not seek out this care and primary-care providers do not have time to provide this care given all of the competing health-prevention needs. Let us assume that children born with microcephaly suffer a reduction in life expectancy. And each year of life lived with microcephaly is also associated with an 82% reduction in quality of life. In addition to our regular roundup of journal offerings, the current issue of Medical Anthropology is a special issue, entitled “Diversions of Biomedical Technologies in a Globalized World,” on which we have posted here. This paper draws on interview and ethnographic data to describe donor accounts of blood donation in England, and how this contrasts to their responses when invited to also participate in two associated public health research studies. Donor views about usual blood donation combine the general, if flexible, theme of altruism with powerful notions of the social collective, giving rise to the sense that they are making tangible, physical ties and constructing a social body through the act of donation. However, their accounts of research participation are more open and ambiguous. At the core of this is the sense that they do not know what exactly they are ‘giving’, since the research is ultimately about collecting information, rather than substance. Equally, the donor-participants are not sure who they are giving it to, since they have no sense of the social collective that potentially might benefit from the research. The paper argues that the concept of ‘the population’ in public health is not only a term that is alien and abstract for the blood donors, but increasingly is a post hoc category for large-scale epidemiological studies. As a result, rather than supporting the obvious assumption that individual bodies make up populations, in practice, particular population renderings determine the nature of individual bodies. This metaphor, brought forward by Eileen Moyer in a panel on containment organized by Alex Nading and Rebecca Marsland, is just one of the many creative proposals about the relationship between global health and medical anthropology that circulated at MAGic2015. The conference, jointly organized by the EASA Medical Anthropology Network and the RAI Medical Anthropology Committee, was held at Sussex University September 9-11. The MAGic conference aimed to interrogate the paradigms and practices of Global Health. From Wednesday to Friday, opening keynote lectures were followed by six parallel panel sessions for a total of 52 panels and lunchtime events, including the Sussex Glocal Health Hive, the annual meeting of the EASA Medical Anthropology Network and a Wellcome trust presentation on funding opportunities. The conference drew 350 participants, of whom almost a third were young scholars working in Global Health. The third meeting of its kind — in 2011 the EASA medical anthropology network held a conference on the theme of medical pluralism in Rome and in 2013 EASA and SMA joined to discuss “Engagements and Encounters&rdquo; in Tarragona — the conference again offered a rich platform for formal and informal debate, the start of new collaborations and initiatives, and the space for interdisciplinary engagements. Somewhere between 6,000 and 20,000 Rohingya refugees from Myanmar are drifting in the Andaman Sea while neighbouring countries take turns to deny them entry. One reason is probably old-fashioned population control. The parliament of Burma (officially known as the Union of Myanmar) recently passed a new “population control&rdquo; bill that could represent a serious setback for the country&rsquo;s maternal health advances if implemented in a coercive or discriminatory manner, according to Physicians for Human Rights (PHR). The bill, which introduces the practice of “birth spacing&rdquo; or a three-year interval for women between child births, is expected to be signed by President Thein Sein in the near future. Although the bill seems designed to implement the Millennium Development Goals, which will expire in 2015, it could easily be used as a tool to oppress Myanmar&rsquo;s ethnic minorities, especially the Muslim Rohingyas in the north. Regional authorities will be able to impose population policies if population growth, accelerating birth rates, or rising infant or maternal mortality rates are negatively impacting regional development. According to The Irrawaddy newspaper, an “imbalance between population and resources, low socio-economic indicators and regional food insufficiency because of internal migration&rdquo; are also reasons to invoke the law.